India. DGMO Lt Gen Ranbir Singh. On 04 June 2014, Indian troops on patrol were attacked in the dense Jungle of the District Chandal of Manipura, India by separatists. In this ambush three trucks and a jeep of Indian army were destroyed. 20 soldiers were killed and 15 were severely injured. Separatists termed this as welcome notion for Modi who had taken control of Indian govt. few weeks ago. Indian blamed Pakistan for this attack without mentioning name and declared that attackers would be punished in exemplary manners. It was necessary for the most popular leader of Hindu extremists to take some action against separatists in order to satisfy his extremist followers and media. 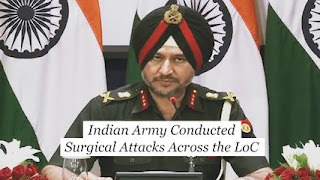 On 10 June 2014, DGMO Major General Ranbir Singh who has be en now promoted as Lt. General, unveiled in a press conference that Indian army conducted a surgical strike in the territory of Myanmar killing 30 to 50 separatists. He told media that this surgical strike was conducted by Parachute Commandoes of 21st Para Regiment who attacked two hideouts simultaneously. One at the Nagaland on the hideout of Naga separatists while other in the Myanmar and all militants were killed. Junior Federal Minister for Information Rajia Wardhan Singh said that India is not Yemen or Iraq that anyone may target Indian army with India. This surgical strike is also a message for the neighbors who provide hideouts to the separatists. A journalist questioned by neighbors you mean Pakistan; Minister said, “yes you are correct”. 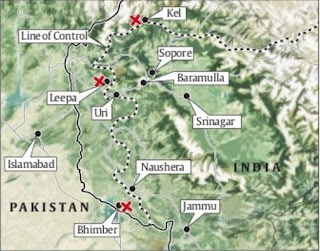 On 29 September 2016, Indian DGMO Lt General Ranbir Singh held another press conference and revealed that Indian army conducted surgical strikes in 5 areas across LoC in the area of Azad Kashmir. World was jolted on this breakout because including Al-Jazeera many international media channels were giving news reports about exchange of firing between Indian and Pakistan army over LoC which started after midnight. ISPR has also reported that two Pakistani soldiers were martyred as a result of unprovoked Indian firing over LoC. 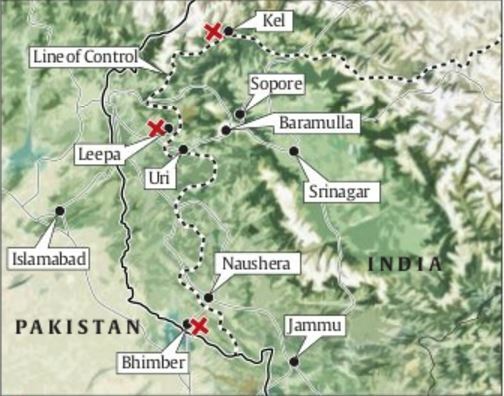 While Indian DGMO claimed that in the successful surgical strikes at Azad Kashmir, Indian troops went 3 Kilometers inside Pakistani area and destroyed 5 hideouts of Kashmiri freedom fighters in Pakistan who were planning terrorism. 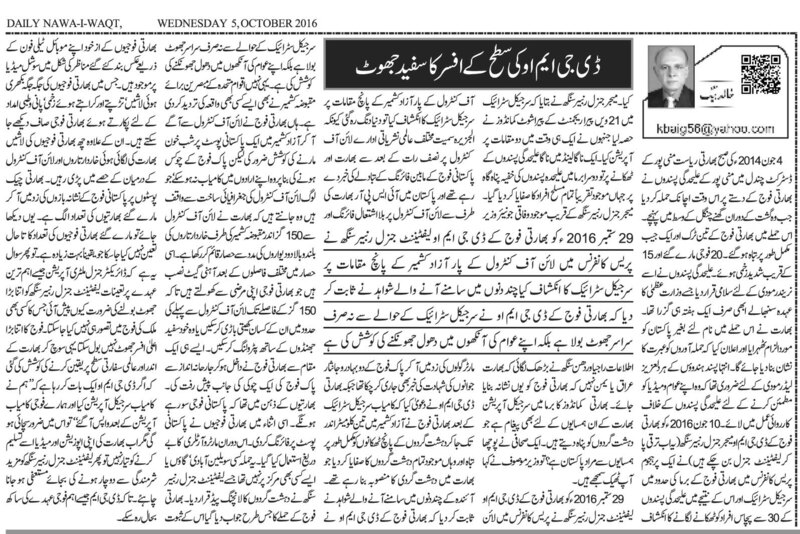 The evidence reported in next few days made it clear that Indian DGMO had not only lied about the strikes but attempted to deceit Indians. Not only this, UN Observers for Kashmir also rejected any such attack or instance. However, Indian army attempted to attack a Pakistani check post in the dark of the night crossing LoC but they failed in their nefarious designs as Pakistani soldiers were alert and awake. Those who know about the geography of the LoC are aware that India has constructed high walls of barbed wire 150 yards inside of Indian LoC, iron gates have been erected in this barbed wire wall which they open themselves allowing farmers to do farming with in the 150 yards or for their own patrolling carrying white flags. Through such a point Indian army attacked Pakistani check post hoping that Pakistani soldiers would be asleep. In the meanwhile Indians opened fire on Pakistani check post using artillery and mortars. This attack was not on a civilian village or some center which was termed by Indians as launching pad for terrorists. In the way befitting reply was given to Indian attack, the evidence is present on social media in the form of the videos recorded by Indian soldiers themselves through their mobiles. These videos show corpses of Indian soldiers spread everywhere, injured crying for water and medics. Moreover, the dead bodies of 6 Indian soldiers were left between the LoC and Indian barbed wire wall. The number of Indian soldiers killed by the Pakistani snipers is separate. The number of Indian soldiers killed have not been confirmed yet.